Sharing is not the buzzword of the year, but it definitely is (and will be) the most popular activity on the web. Sending data to your friends gets easier through various services popping at an amazing rate. However, delivering large files, way above the limitations of an email attachment, has been tackled mainly by online storage services. 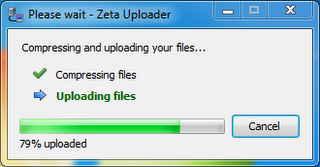 Zeta Uploader is free of charge and the desktop client installs quickly, with no fuss. By default the interface is contracted to only the simplest and most necessary options: pick the data you want to send, punch in the recipient(s) email addresses together with the message you want delivered; but you can expand it to more settings. Zeta Uploader is the perfect solution for sending larger attachments online, no need to worry about file size limitation set by most email services. This freeware is designed to be simple, in just a few clicks, your files will be on their way to the receiver. The operation consists of attaching files, typing your receiver email address, write a message, then hitting the Update now button. 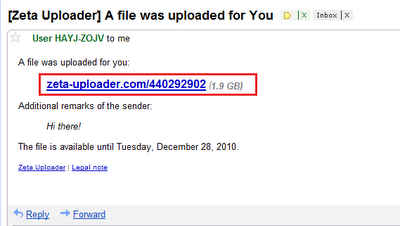 The receiver will shortly get an email with a download link. Downloads can also be protected with passwords. 1. Download and install Zeta Uploader, then launch it. 2. In the application's main interface, click the small black arrow related to "Files to upload" section, then select Add files/Add folder option to add files you want to send to the receiver. 3. Insert now the receiver email in the correspondent text box, then write a message for the receiver. When done, click the Update now! button. 4. Wait now while the application compress and upload your files.